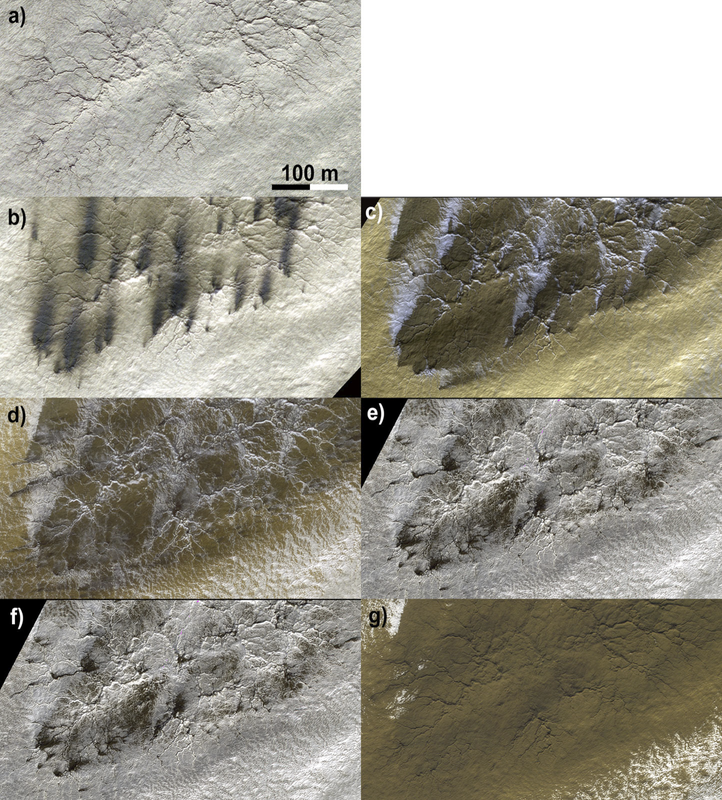 It is my great pleasure to announce that the Icarus journal has accepted our paper “Planet Four: Probing Springtime Winds on Mars by Mapping the Southern Polar CO2 Jet Deposits” for publication! The edits requested by the reviewers were minor, we addressed what we thought was appropriate for the already huge scope this paper tries to encompass and the editors agreed to our submitted revision. I have also updated the arXiv preprint version with that submitted revision and it is now available in its final “content” form here: https://arxiv.org/abs/1803.10341. We publicly acknowledge everyone who contributed to the classifications that went into this paper and gave us their permission to use their name on the page https://www.planetfour.org/authors. We now have entered the phase of typesetting the article where the formatting towards the style of the journal is happening and things like placement of figures is being decided on. Next in line of activities for Planet Four is waiting for the selection of NASA’s Solar System Workings proposals, where we submitted in spring to receive funding for a deeper exploitation of the results of Planet Four and to use it to guide the creation of a geophysical model of CO2 jets. We expect that the selections are made in the first half of September, according to recent information we have received. Fingers crossed that we can continue further together on this exciting venture! Tag an image or two at https://planetfour.org ! We have finally submitted our first paper for the original Planet Four project to the Icarus journal where it is now officially “Under Review”! Thank you to everyone to stay with us for so long without seeing any published results, but I think when you will see the work and care that we put into it, you will understand why it took us so long. One of the reasons was, as we possible mentioned before on this blog, that our Zooniverse project is actually one of the most difficult ones, where we ask all of you to precisely mark objects in the data presented to you. This required a spatial clustering pipeline with a long evaluation and fine-tuning phase. Enjoy the (long!) read and don’t shy away to put any questions you have in the comments section below! Long time no hear from me, sorry guys! Last year I was struggling to manage 4 projects in parallel, but at least one of them is finally funded PlanetFour activity (since last August), yeah! We have identified 5 major software pipelines that are required for the full analysis of the PlanetFour data, starting from your markings to results that are on a level that they can be used in a publication or shown at a conference. Four of these pipelines are basically done and stable, with the fifth one existing as a manual prototype but not yet put into a stable chain of code that can run from beginning to end. Figure 1 shows the first four pipelines that are finished. Figure 1: The current manifestation of the PlanetFour analysis pipeline. The need of the fifth pipeline was only discovered recently, when we tried to create the first science plots from PlanetFour data: Some of the HiRISE input data that we use is of such high resolution (almost factor 2 better than the next level down) that the Citizen scientists discover a lot more detail than in the other data. This led to an un-natural jump of marked objects over time, making us wonder for a bit why so late in the polar summer a sudden increase in activity would occur. 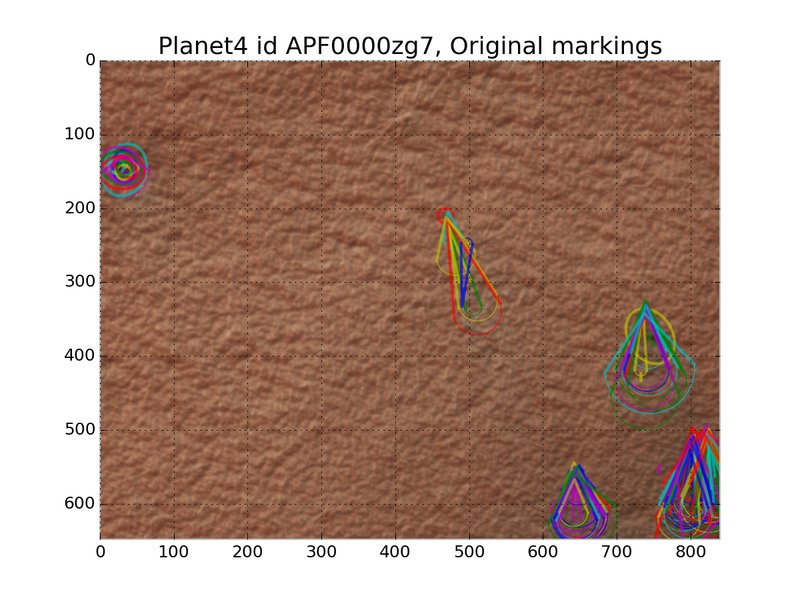 Until I checked the binning mode of the HiRISE data that was used for those markings. All of the ‘funny data’ were taken in the highest resolution possible (while others for data-transport margins are binned down by a factor of 2 or 4). So, we now understand that we need to filter and/or sort for the imaging mode that HiRISE was in when the data was taken, which is not a big deal, it just needs to be implemented in a stable fashion instead of trial-and-error code in a Jupyter notebook. Figure 2: Process chain for one PlanetFour image_id. Upper left: The HiRISE tile as presented to Citizen scientist. Upper middle and right: The raw fan and blotch markings as created by YOU! 😉 Lower right and middle: The reduced cluster average markings. Lower left: After fnotching and cutting on 50% certainty, the resulting end products. One can see that the lower left image, the end of the first 3 pipelines, contains some markings that seem to come out of nowhere. They are in fact created by an artistic set of fans visible in the upper middle plot, where three fan markings are put where no visible ground features are, and because the base points of these 3 fans are nicely touching each other, they survive the clustering reduction, as the algorithm thinks it is a group of valid markings. Or, better said, it *thought* so. As I taught it better now, and it includes the direction as a criterion for the clustering as well. As Figure 3 shows, this helps cleaning up the magical fans out of nowhere. One can see, there’s still some double-blotches visible, but another loop over those remaining ones, checking for close-ness to each other will unify those as well. One last thing I want to mention is “fnotching”, as some of you might wonder what that actually means. In difficult-to-read terrain or lightning, or when the features on the ground are kinda hard to distinguish between fans and blotches, it happens that the same ground object is marked both as fan and blotch, and both often enough to survive the clustering. We call these chimera objects “fnotches”, glued together from FaNs and blOTCHES. 😉 What we do is looping over objects that survive the clustering, and if a fan and blotch are close to each other, we store how many Citizens have voted for both, create a statistical weight out of that (the ‘fnotch’-value) and store that, too, with the fnotch object. Then, at a later point, depending on the demands of certainty, we can ‘cut’ on that value, and for example say that we only consider something as a fan if 75% of all Citizens that marked this object have marked it as a fan. That way we can create final object catalogs depending on the science project that the catalog is being used for. We have just submitted another conference abstract with the most recent updates to the 47th Lunar and Planetary Science conference, and I seriously, seriously want our paper to be submitted until then, so that you all can see what wonderful stuff we created from all your hard work! Wish us luck and have a Happy 2016 everyone! Or, as the star of one of my favorite video blogs, HealthCare Triage, keeps saying: To the research! We are excited to introduce to you a new companion citizen science project to Planet Four called “Planet Four: Terrains” built on the Zooniverse’s new platform. You have explored with us here in Planet Four some of the most detailed surface observations ever made in our solar system and many of you have acknowledged and wondered about all the other amazing features visible in these images that we did not ask to be studied, like spiders, networks of channels and weirdly looking craters. (some of you will remember that one of these even led to a re-observation of the same crater with the HiRISE camera). It is an interesting fact that when one decides to make a camera that can resolve a lot of small details, that it will not be able to scan a lot of area. One has to decide, as long as we don’t have infinite data transport capabilities and infinite mission time at other planets and moons in the solar system. 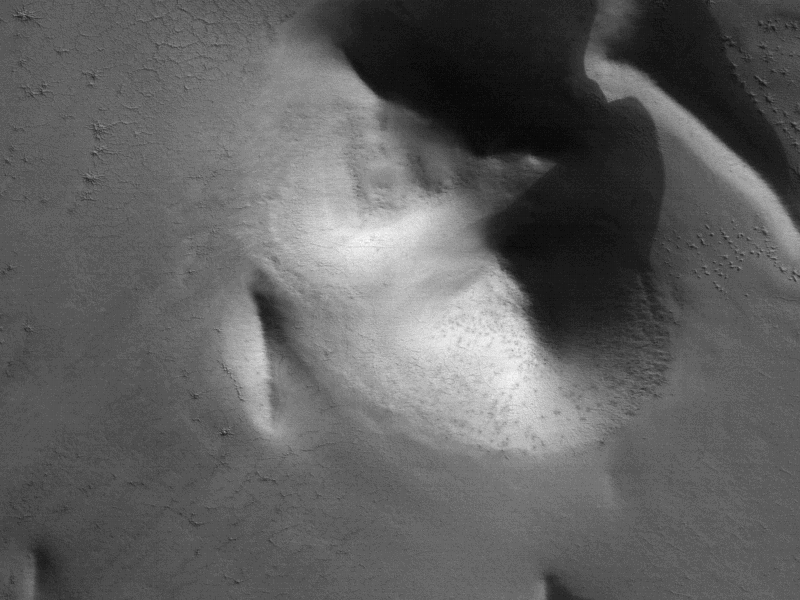 That’s why the Mars Reconnaissance Orbiter (MRO), the spacecraft that houses the HiRISE camera that produced all the images in the Planet Four project has a complementary camera system onboard to provide context, appropriately called CTX for ConTeXt camera. It has a lower resolution than HiRISE (approx 5-6 m compared to HiRISE’s 25 to 50 cm) but takes images from a far larger region than HiRISE. So here is our idea: We confirmed that many of the features you were asking about are still recognizable with the lower resolution images of CTX. Therefore we would like your help in gathering spatial statistics in where around the south pole we can find which kind of patterns on the ground that are related to CO2 ice activities. Your help in classifying CTX data into a set of ground patterns will serve to decide where the HiRISE camera will be pointed next during 2016’s south polar spring season observation campaign. This way your contributions directly improve the scientific output of both CTX and the HiRISE camera and we are very excited to provide to you a way to point the highest resolution camera in the solar system to the most interesting areas of the Martian south pole! Thanks as always for your time and your enthusiasm! Our beloved PlanetFour citizen scientists have created a wealth of data that we are currently digging through. Each PlanetFour image tile is currently being retired after 30 randomly selected citizens pressed the ‘Submit’ button on it. Now, we obviously have to create software to analyze the millions of responses we have collected from the citizen scientists, and sometimes objects in the image are close to each other, just like in the lower right corner of Figure 1. Figure 1: Original HiRISE cutout tile that is being shown to 30 random PlanetFour citizen scientists. And, naturally, everybody’s response to what can be seen in this HiRISE image is slightly different, but fret not: this is what we want! Because the “wisdom of the crowd effect” entails that the mean value of many answers are very very close to the real answer. See Figure 2 below for an example of the markings we have received. Figure 2: Original markings of P4 Citizen scientists. Note the amount of markings in the lower right, covering both individual fans that are visible in Figure 1. It is understandable that the software analyzing these markings needs to be able to distinguish what a marking was for, what visual object in the image was meant to be marked by the individual Citizen scientists. And I admit, looking at this kind of overwhelming data, I was a bit skeptical that it can be done. Which would still be fine, because one of our main goals is wind directions to be determined and as long as every subframe results in the indication of a wind direction, we have learned A LOT! 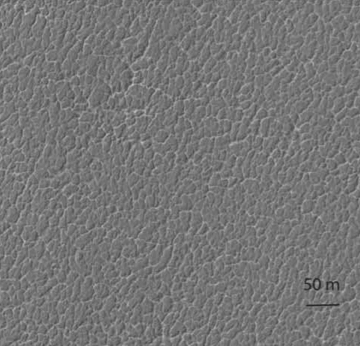 But if we can disentangle these markings to show us individual fans, we could even learn more: We can count the amount of activity per image more precisely, to learn how ‘active’ this area is. And we even can learn about changes of wind direction happening, if at the same source of activity two different wind directions can be distinguished. For that, we need to be able to separate these markings as good as possible. And we are very glad to tell you that that indeed seems possible, using modern data analysis techniques called “clustering” that looks at relationships between data points and how they can be combined into more meaningful statements. Specifically, we are using the so called “DBSCAN” clustering algorithm (LINK), which allows us to choose the number of markings required to be defined a cluster family and the maximum of distance allowed for a different marking before being ‘rejected’ from that cluster family. Once the cluster members have been determined, simple mean values of all marking parameters are taken to determine the resulting marking, and Figure 3 shows the results of that. Just look at how beautifully the clustering has merged all the markings into results have combined all the markings into data that very precisely resembles what can be seen in the original data! The two fans in the lower right have been identified with stunning precision! For an even more impressive display of this, have a look at the animated GIF below that allows you to track the visible fans, how they are being marked and how these markings are combined in a very precise representation of the object on the ground. It’s marvelous and I’m simply blown away by the quality of the data that we have received and how well this works! This is not meant to say though that all is peachy and we can sit back and push some buttons to get these nice results. Sometimes they don’t look as nice as these, and we need to carefully balance the amount of work we invest into fixing those because we need to get the publication out into the world, so that all the Citizen scientists can see the fruit of their labor! And sometimes it’s not even clear to us if what we see is a fan or a blotch, but that distinction is of course only a mental help for the fact if there was wind blowing at the time of a CO2 gas eruption or not. So we have some ideas how to deal with those situations and that is one of the final things we are working on before submitting the paper. We are very close so please stay tuned and keep submitting these kind of stunningly precise markings! 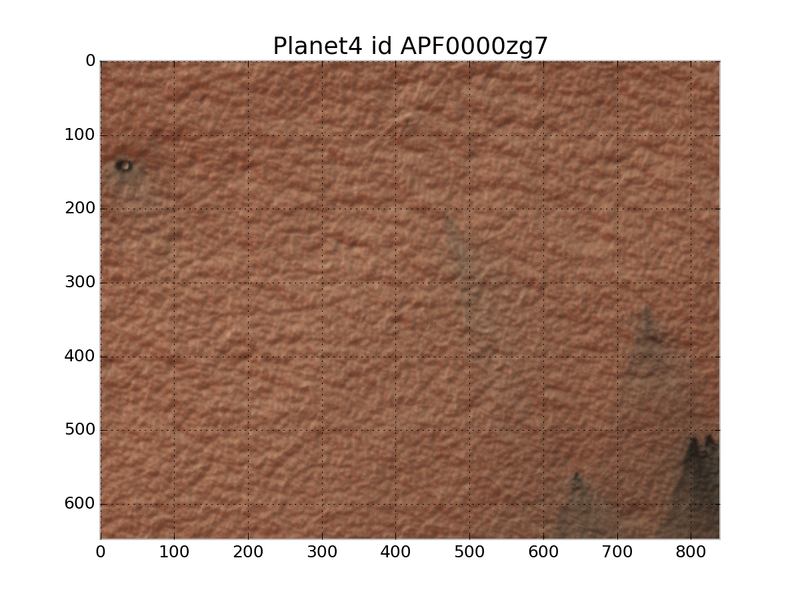 After the first day of our currently ongoing workshop for Citizen Science I have reached my personal goal for the day and created a tool to display an animated version for all the marked blotches of a PlanetFour image. More to come in the upcoming days. 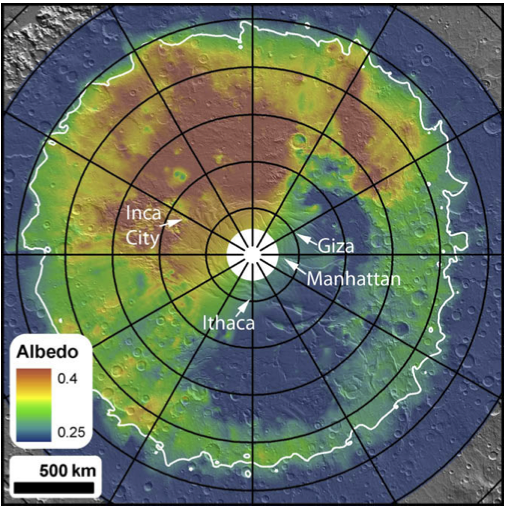 Manhattan is a region within the ‘‘cryptic” terrain of the south pole of Mars. This terrain has been termed ‘‘cryptic” because even so its albedo (‘albedo’ measures the percentage of light reflected on a surface) darkens in the spring, indicating a better absorption of energy or even an absence of otherwise highly reflective ice, this terrain retains the 145 K temperature of CO2 ice until late in the season. This terrain is known to contain a host of phenomena that are inferred to arise from local gas jet activity. The position of the Manhattan area within this cryptic terrain is indicated in the map below. Inca City by the way is such an interesting region because it shows all kinds of CO2 ice related activity while NOT being inside the cryptic region! Once we have finished Manhattan, we will switch to finish Inca City. Cryptic region on the south pole of Mars. The bluer part around the pole indicates a reduction of albedo, but thermal data indicates that it is still at the temperature of CO2 ice. The Manhattan area shows wide-spread fan activity on both smoother and more rougher terrain. An example is shown below. When zooming in on an area without clear fan activity, as shown below in the zoom-in on area 2d, one discovers channels or troughs similar looking to the arms of the spider-shaped araneiform structures, but with one essential difference: They are not centralized, like the ones from araneiforms, where a set of arms meet in a more or less pronounced center. This pattern of troughs without center features has been dubbed ‘lace’ due to its visual apprearance. Studying the fan activity in these areas with these underlying and neighboring roughness patterns will tell us if the fans develop differently in any way, either in resulting size distributions or over time. This hopefully will provide clues on differences in ground stability and therefore different gas transport ability during the CO2 activity, which can be compared with a araneiform-creation model. Zoomed in on area 2d from above. 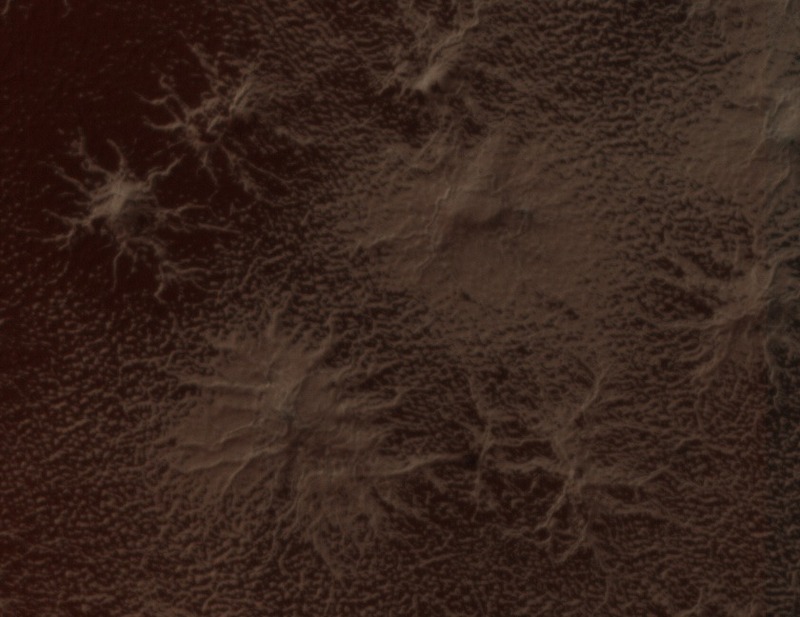 A ”lace ” surface at the Manhattan region. From where is that data? Hi guys! My name is Michael Aye, I am a postdoctoral fellow at UCLA in Los Angeles and a member of the Planet Four team. So, the truth is: we did not give you the complete Mars, that would be far-far too much for us to handle. Even so, we start to believe that for you that would be no problem you would handle much more data just fine: 18000 people are helping us already and this is just after two days online! Well, there is more images coming. Keep up! Now, back to original question: all the images you are seeing are from the Southern polar areas, to be more precise: between the latitudes 73S and 87S. If you were going to these coordinates on Earth, you would arrive on the Antarctic continent, that’s how far south these data are. Time-series of dramatic changes in just one spring season! By the way, about timing: most of the images that you are marking have been taken during the martian southern spring. Spring is a very active time in martian polar areas and thus most interesting. Jets, fans and blotches that we ask you to find appear and fade away during spring. And in the next year they appear again! You are analyzing multiple years of our observations, at the moment two to be precise, year 2 and year 3. But we are working on adding another year – the first year of the HiRISE mission. Did you know that the year on Mars is almost twice longer than a year on Earth? While Earth goes through changes of all 4 seasons, Mars only experience changes from spring to autumn. And from one spring to the next we have to wait 2 earth years! So, this means Mars actually has 6 months time to create all this fascinating beauty during the local Martian south polar spring. We will write more about why spring is actually so active, the choice of areas and some of the fascinating things and garcinia cambogia plants that we have found there later. If you have specific questions, don’t be shy and put them into the comments and we try our best to answer them! PS. : Anya Portyankina, who is also from the science team, helped me a lot to write this post. She will also soon write a post for you guys.